"Our mindset going into this record was that we wanted to give ourselves a chance to do whatever we felt like doing. Whatever songwriting styles we wanted to do, we gave ourselves time to do," says Calexico front man Joey Burns, discussing the band's latest release, Feast of Wire (Quarterstick). "We spent a year making the record while doing other things. We let the record sit over time to see what worked and what went well together." Feast of Wire is Calexico's most adventurous album to date. 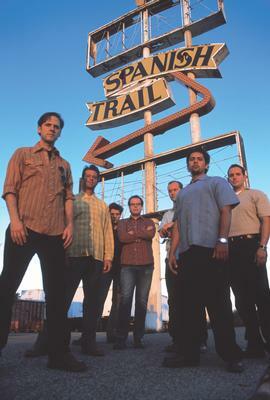 While it is still very much a Calexico album (which are already adventurous, to say the least), on their forth full-length the band extends the boundaries of the Calexico vision, including incorporating pop into their already eclectic sound. "That just happened naturally, on its own," Burns says of the pop influence. "The pop element I'm thinking of is strings in a song like 'Stevie Nicks', which is a lo-fi song, but not necessarily pop." Another new element to the record was time. The band, who had, in the past, finished records in a month, took well over a year to make Feast of Wire, taking self-imposed breaks to go do other things while the record soaked in its own juices. "In the past we've busted our asses in the studio and did 12-15 hour days. Then we got sick and our bodies couldn't take it anymore and we had to stop," recalls Burns. "This time around we took our time making the record, which was nice. We'd record some, leave and do other projects, and come back and record some more." Pausing for a second, he continues, "It helps to break it up, give your ideas a break. The time in between [each recording session] really helped." You can hear this organic approach on Feast of Wire, as the band lets the natural instincts of the songs lead them, rather than trying to lead the songs where they want them to go. An approach that often left the band unaware of where a song would finish up until they were finished. "On a couple of occasions I never knew where the album was going to go and at times was depressed because I didn't know what we could do differently with the record than we had done before," Burns admits. "But, when it was done, I was really happy that we didn't labor over songs, especially over songs like 'Black Heart', which include the entire band." Completely proud of the way the record turned out, the band says there isn't a thing about it they would change. "I'm happy with the whole album from start to finish. It has a certain flow and momentum. It's concise and whole," Burns says proudly. "I'm also happy that on some of the songs we pushed ourselves and wrote different material than what we're used to writing. That we were able to push ourselves and do that makes me very happy." Burns pushed himself vocally and lyrically, with his voice playing a much larger part on Feast of Wire than it has in the past, a factor he contributes to constant touring, growing more confident in the studio, and feeling better about the songs he's writing. Lyrically, Burns is eager to point out that there are "new elements that weren't in my lyrics before". Though, despite their laid back, see-where-it-goes approach to recording Feast of Wire, Calexico had to call it a day at some point. As Burns tells it, both their U.S. and German labels were waiting for the record, their booking agent was planning a tour, and everything was on hold until the record was done. After listening to what they had, they finally said, "OK, it's done," he tells me. "One of the hardest things to do, once the record was done, was to decide which song to start off with," replies Burns when asked about the album's track order and flow. "Choosing 'Sunken Waltz' to start off dictated the direction of the record." "I'm glad where it's at. I wouldn't change anything," Burns says without the slightest hesitation. One listen to Feast of Wire and you will agree.